Father’s Day weekend ushers in a lovely celebration between families as people gather to honor their fathers. It’s warm enough to take an outing to the beach or lake, have a cookout or throw a ball around in the backyard. Some dads may want to watch the baseball game together and others may just want some peace and quiet. Whatever the activity of choice, it’s a day to pay special attention to the patriarch. The holiday is also an excellent time to reach out to past customers and attract new clients with deals, contests and promotions. Don’t forget to think about dads who are in an untraditional role such as step-fathers, god fathers and men who consider themselves dog dads to a four-legged friend. Social media contests are a great way to build buzz around the brand, bring in new customers and show off the business’ personality. It’s fun to think of new ways to garner participation whether it be on Twitter, Facebook or the company web page but here are a few thoughts to get the ball rolling. Consider holiday-inspired events such as father/son and father/daughter look-a-like photo contests. Have people submit quotes from their fathers or “my father says…” statements for an eclectic and personal way to honor dads. Another idea is to have followers post Father’s Day traditions. Those submissions may even inspire other fans to try out some of the traditions with their own families, thanks to the business that started the conversation. The prizes for the contests should be aimed towards the father demographic. Since it’s almost summer, think about gifts for the outdoors, such as sports bottles and coolers. The Koozie Fiesta 12-Pack Cooler and the Koozie Collapsible Party Cooler with Stand seem perfect for pops. Men may also be interested in multi-function tools like the Promotional Multi-Tool Carabiner or Custom Tape Measure with Level and Notepad. One way to acknowledge the holiday from a business standpoint is to offer discounts for fathers or people buying gifts for their fathers. It may also be helpful to tailor products and services to common Father’s Day activities and presents. For example, it’s a huge weekend for golf outings. Consider promotional giveaways or a complimentary gift with purchase like a Wilson Ultra Par Pack with Personalized Golf Ball-N-Tees or Wilson Ultra 500 Distance Golf Ball 12 pack. Another giveaway idea is BIC Custom Pencils, which are available in more than 10 colors to take on the course. Fathers may also like small packs of candy that will easily fit in their golf bags in case they need a sugar boost around the sixth hole. Check out the Gummy Bear Pillow Bag, the Swedish Fish Pillow Bag or the Assorted M&Ms Pocket Tin. It’s typical for people to treat dad to a nice meal on his special day so this is the perfect weekend to reach out to customers with promotional products. It may be beneficial to create specific menus for the occasion, like a buffed-up brunch or a three-course prix fix dinner. 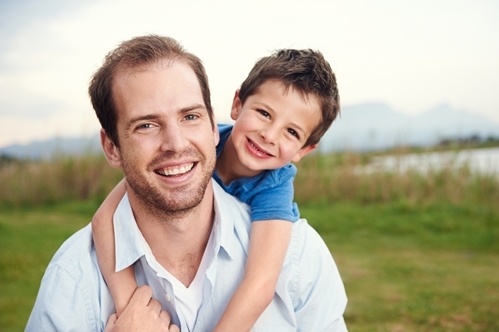 Consider providing a complimentary piece of cake or serving of another dessert for dads. One way to incorporate these customized items is by giving gifts to guests who spend above a particular amount on their meals. Some products that are industry-appropriate and dad-friendly are bottle openers and coasters. Look at the custom aluminum opener or custom balancing version. There is also an engraved keychain bottle opener and a custom steel design. For coasters, consider the personalized round coaster, custom lugano coaster set or Saturn swirl coaster set.